Golf is a fast paced game that doesn't call for much thought but requires just the right amount of skill to prevent it from becoming too mechanical. The game comes out fairly often too so it's fairly rewarding. In short, it's a fun, speed game and once you're "in the zone", some quite unbelievable times can be achieved. The game is played with a single pack of 52 playing cards. Seven columns are dealt, each consisting of five face up and slightly overlapping cards. The exposed card at the bottom of each column is available for play. The remaining cards are placed face down to form the stock. Cards are turned one at a time from the stock to a single waste pile where building occurs by transferring exposed column cards according to the rules of the game. All building is carried out on the single waste pile. 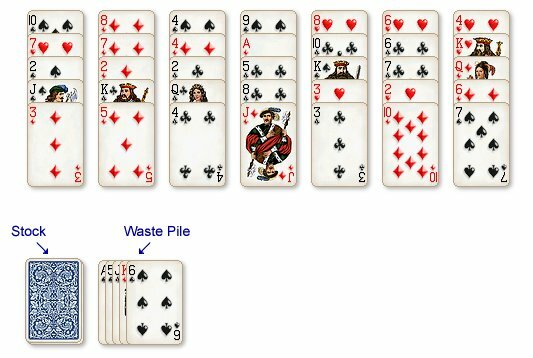 A single, exposed card from one of the seven columns may be transferred to the waste pile if it follows either an ascending or descending sequence regardless of suit. So in the above example, either the 5 or the 7 may be built on the 6 . Sequences may turn the corner with Kings building on Aces and Aces building on Kings. When no more cards from the columns can be transferred to the waste pile, a card from the stock is dealt to the waste pile and building resumes. When the stock is exhausted, and no more building can occur, then the game is over. When playing Rules 1 and 2, for your first move you may play any of the exposed column cards to the waste pile to get the ball rolling, so you'll have to scan the cards really quickly to see which card might release the best initial sequence. For all other rules, an initial card is dealt from the stock to the waste pile so you have to build on that. Be aware that your score is entirely proportional to the time you take to clear out the columns, so you're gonna have to motor ! My personal best on Rule 1 is 43 seconds and I was flying. Sub-minute times seem impossible at first, but if you keep playing Golf endlessly, you find yourself playing on instinct and scanning several moves ahead. It can get quite frantic ! Don't forget, you can double click or right click on a card to send it flying to the waste pile.